In 2015 I quit my tech sales job in San Francisco and escaped the rate race with plans for a circumnavigation. I quickly learned Rule #1 on a boat: plans change! I became obsessed with Fiji, started surfing and 2019 will be my 4th season here. My boat is a modern and fast Beneteau Oceanis 423 that’s been upgraded in every way necessary so we can safely and comfortably live off the grid. As long as the food lasts. I’m used to sailing and have even done long passages on my own but lucky for you, I'm a believer that experiences are even greater when shared! I spend a lot of time around the surf breaks. Surfing has become an obsession. If you know, you know... I have also just started to learn how to kite surf. 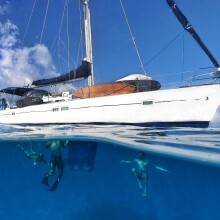 Life on board “Carthago” is all about enjoying good food, conversation, and staying active by hiking, fishing, kayaking, free diving/snorkeling/spear fishing, bonfires on uninhabited islands, etc. I wanted to get to the surf breaks faster and more comfortably, so I've even acquired a little 15ft skiff with a bimini which we’ll be using to get to the surf breaks and go on adventures on as well! - Expenses are a fixed amount per day and will cover everything on board (food, beer a contribution for fuel, etc.) Vegetarians, vegans, pescatarians, carnivores, alcohol abstainers all contribute the same amount. - Sailing experience helps but isn’t necessary. However, good attitude is a must. I’m happy to teach you the rest! - Cleanliness, tidiness and safety go hand in hand on a boat. And I take safety very seriously! - I usually expect a 1 month commitment to start, and then we can go from there... If you want to spend less time I suggest googling "Fiji charters"
- I'll probably ask you to bring a bottle of rum and your favorite drink from the Duty Free if you're flying in. - Life on a sailboat can be tough. Sometimes you can’t get sleep because the boat doesn’t stop moving back and forth, sometimes you have to wake up in the middle of the night because the wind picks up or the swell comes in unexpectedly and we have to change anchorages, things break and we have to adapt quickly, there’s limited water (you can shower every day, but it’s a short shower), power is limited (we live off solar panels and a wind generator), you need to be astute and move quickly when needed, the boat needs to be kept clean and we all share tasks on board such as washing dishes, cleaning, etc. I think it’s important to be upfront about this, it’s not just the glamorous Instagram shots you see, there's a tough lifestyle behind it all, but I personally think earning it makes it that much better! - I don’t *need* crew but I’m looking for people I would *want* to share this adventure with. What would your contribution be to life onboard? HINT: You’ll probably get bonus points if you know/want to learn to surf/kitesurf / know your way around the galley / play a musical instrument / are into photography/video. Mention this when you message me! If you can’t join but want to follow along you can check out @sailingseabbatical on Instagram and stay in touch for future opportunities! There are lots of up to date pictures too if you want to have a better idea of what this shared experience is all about! Boat descriptionThe boat is a very modern and fast Beneteau 423 that’s been upgraded in every way imaginable so we can be “on the hook” for as long as the food lasts! I’ve sailed this boat from San Francisco to Fiji. It has all the safety equipment you could ever need for blue water Sailing safely.